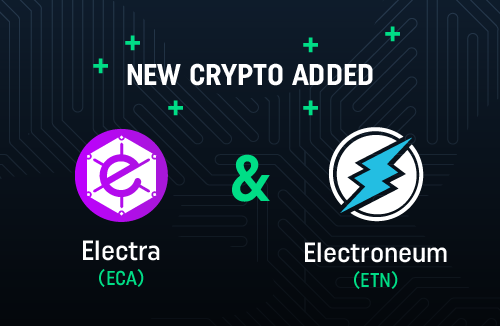 … ElectraCoin (ECA) and Electroneum (ETN)! As a reminder, in the 8th voting on CoinDeal - a cryptocurrency exchange platform, Electra got the first place with the breaking record amount of votes - 3154! Electroneum was in the second place with a little over 1500 votes. It’s nice to see how involved you are in the future development of the platform by taking part in “vote for a new cryptocurrency” system! What exactly is ! ElectraCoin? ECA is a cryptocurrency based on Proof-of-Work/Proof-of-Stake algorithm which means that this crypto can’t be mined by new miners. The mining stage has already ended, but everyone can stake the coins to generate additional ECA. The maximum supply of this coin is 30,000,000,000. ElectraCoin is paired with Bitcoin on CoinDeal. It may seem like Electroneum is from the same family as Electra, but it’s not. Electroneum’s developers focused on designing a cryptocurrency to be massively adopted conducting Instant Payments. This project is almost fully based on smartphone network. It is not only about mining but also the developers have recently signed agreements with global mobile networks. Electroneum is paired with Bitcoin on CoinDeal.! Don’t waste your time and make a deposit on ECA and ETN wallets, because… … soon we will announce two contests for the most active traders on ECA/BTC and ETN/BTC markets!